Tim and Jasmine’s story is a story filled with faith and gratitude. They are very committed Christians, who are deeply rooted in their communities of faith. Along with clear recognition of God’s goodness in their lives throughout the day, there is an abundance of sports references. Along with being a sports enthusiast, Tim also had his first encounter with princess Jasmine on the softball field. Tristan and I start our day at Black Creek Pioneer Village. I’ve done a wedding photo shoot there but I didn’t know they hosted weddings! But we find ourselves hanging out with Jasmine, Tim, and their respective entourages as they get themselves ready for the big day. After everyone is dressed, Tim and Jasmine exchange gifts and read the beautiful cards they received. Unfortunately, I didn’t have room for this in the film because there was so much other great material I wanted to include. However you will hear snippets of those letters in their sneak peek video that was released in the summer. Shout out to Jasmine for getting her man tickets to a Packers game in the fall! After the gift exchange, we take our couple out on the grounds of the Pioneer village to set up for their first look, followed by video and photos with the Blue Colibri Photography team. As the sun settles high in the sky, Jasmine performs her first of three outfit changes – her traditional tea ceremony dress. The tea ceremony is common for Chinese and Hong Kong families. In short, the bride and groom serve all their relatives older than them some tea in exchange for well wishes and gifts. After the tea ceremony, Jasmine changes back to her white dress and we have our standard western ceremony. The third wardrobe swap happens when the party started at the reception. Tim does a segment of his vow in Cantonese which evokes a range of emotion from laughter to crying. Even though I’m Chinese 50 generations removed (lol), I couldn’t understand but I knew it was important. Getting that segment interpreted was so worth it! Our couple chose to do a foot-washing tradition during their ceremony. 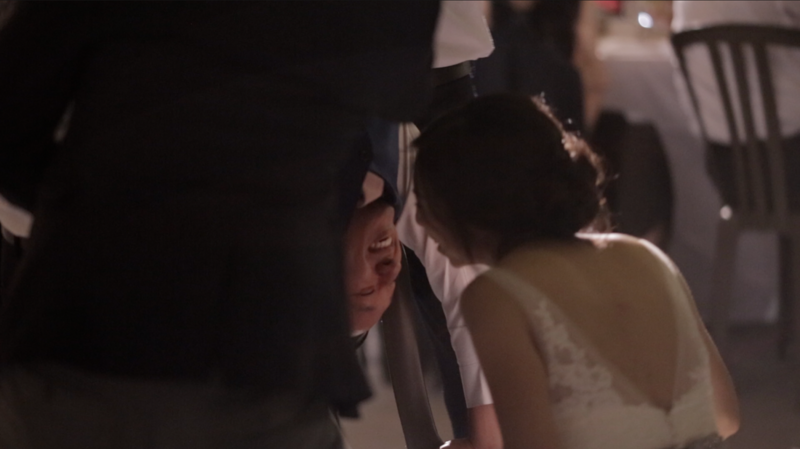 This symbolizes their commitment to be humble to one another and serve each other in their marriage. If you’re a Christian or familiar with the story of Jesus, you’ll instantly recognize this as one of Jesus’ last “big” lessons during the Last Supper. Tim basically gets hazed (kind of) during this reception. After completing feats themselves, the guests, along with the MCs, choose an “interesting” way for Tim to kiss Jasmine. To give you an example, our couple had to do the “Spider-Man kiss”, where the man in upside down (as seen in the 2002 Spider-Man movie when the hero kisses Mary Jane in the rain, hanging upside down in the rain). Jasmine was going for the vintage look for her wedding and, boy did she take it there. You can’t get any more vintage when you host your wedding at a Pioneer Village! Because of the very “Christian” feel of this wedding, I wanted to choose music with lyrics that could mesh with it. Whether it was the artist’s intention or not, I choose songs helped with use of words like “light”, “shine”, “lifetime”, “alive”, etc. As always, I’ll love to get your comments and responses. Stories bring us all together!